In an ecommerce business, you need to constantly find out new ways to improve the marketing process. This can help you increase the sales you are getting from customers or improve the shopping experience of the existing buyers. Develop new tactics to help keep your ecommerce business alive with an increased influx of sales. Given below is a list of a few strategies that you can use. If the design of your website is poor, your customers are bound to be driven away. You can ask your customers to leave feedback on their experience of the design. You can use the best performing themes that already exist for your ecommerce platform to get good results. Alternatively, you can go for A\B testing for garnering the best results. Your customers are less likely to make purchases if you have set prices too high even if the design is brilliant. You can create exit offers so that your customers stay back to purchase when they are about to leave. A\B testing can be useful here to get the best offer. Emails are easily the best tool for your online marketing needs. Use emails to drive traffic to your ecommerce store. Emails can also be used to supplement your content marketing strategies. You should always keep in touch with your customers. This means that they should be kept abreast of their order status by emails. You can send your customers newsletters on a regular basis with discounts and deals. Your customers will remain interested in your store if you do so. Just because you have good keywords for your business does not mean that you should strop implementing variations. By varying them, you can get better keywords. At the same time, keyword variations can help you carve out a nice niche for your business. Encourage your customers to leave behind reviews and ratings for your products. Buyers are more likely to trust your ecommerce stores if your products have reviews. Cart abandonment is a sign that your store is not getting the optimum level of sales or revenue. Therefore, you need to identify the reasons that are causing your customers to leave thaw purchase process. Then implement changes accordingly. You can opt for a recovery campaign through emails so that your customers return to complete the process. People love wish lists for various reasons. Your customers can become interested in purchases if you send them reminders about the items on their wish lists. You can send emails to notify that the items on their wish lists are being offered at discounted prices or are about to be sold out. 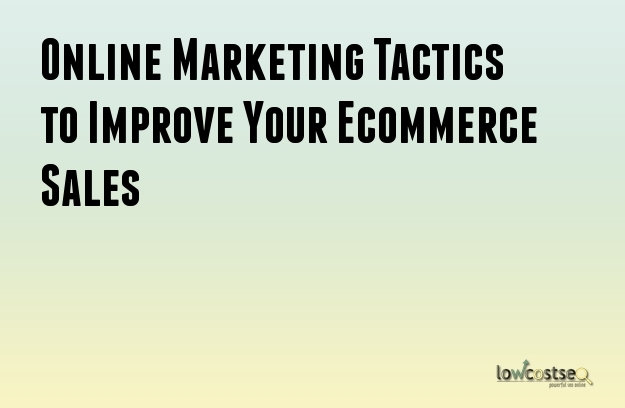 There are similarly many other tactics and strategies that you can use to bring improvements to your ecommerce store. You should remember that your sales will only increase when your customers are enjoying a good experience with your store.